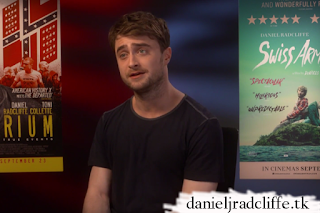 Below you find the UK press junket interviews from the press junket in promotion of two films at once, Imperium and Swiss Army Man. If more appear I'll add them. Thanks to HeyUGuys for the heads up regarding their video(s). Update: 22nd September 2016. Independent.ie. Update: 23rd September 2016. Ode (two videos). Update: 26th September 2016. The Guardian, MTV UK and Loaded (2nd one). Update: 29th September 2016. Sky Cinema (two videos). Update: 4th October 2016. Entertainment News (audio) and Scoop with Raya. Update: 11th October 2016. About James Bond and more. Dubbed in German. Update: 23rd October 2016. Another Sky Cinema video. Update: 25th October 2016. MTV UK. Never Have I Ever game. Update: 31st October 2016. Espen NRK interview. Their Filmpolitiet podcast is here. Update: 9th November 2016. Australia Imperium DVD, Blu-ray release message. Independent.ie. - The house which doubled as Harry Potter's, 4 Privet Drive, has been put up for sale. Sky Cinema - What's my Line? This video is also shared by daniejradcliffe.tk on Facebook.